A luxurious hideaway in a private bush setting, embracing the romance of the sea awaits at St Andrews Beach. 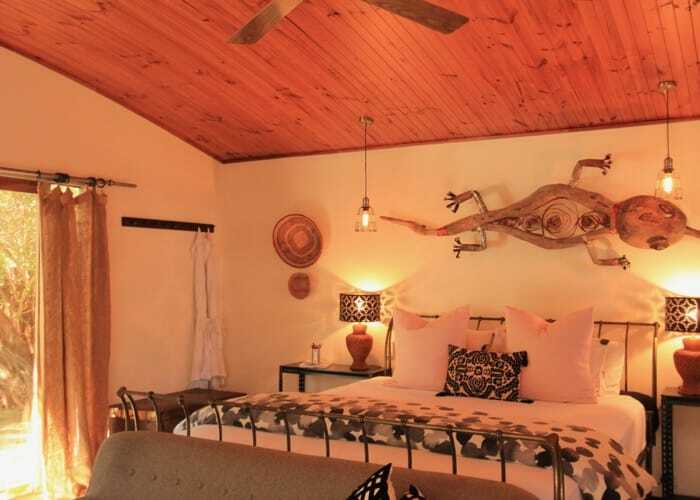 These beachside rooms have been lovingly created with unique African, beach and bush themed interiors. Big Blue Backyard, tucked between Mornington Peninsula's famous St Andrews Golf Course and a wild, dune-covered beach, sits a cluster of three cabins built for romance. It’s the little things that count at Big Blue Backyard, like Olieve & Olie bath products, luxurious linen, freshly baked biscuits and books to read while relaxing and breathing in the sea air. Spacious cabins, each with their own private deck, double spa bath and outdoor shower. Perfect after a long walk on the beach or an afternoon in the surf. Take dinner on your private deck under the stars as the resident chef can whip up a seasonal menu from local produce. Breakfast is to be savoured with your gourmet long tray breakfast with top quality provisions, discreetly delivered to your door. Experience style and comfort with king size beds, fresh flowers, fluffy bathrobes and more at this romantic beachside hideaway. follow Paradise Drive until you can glimpse the ocean and Big Blue Backyard is on the right hand side. Due to the State Law Fire Restrictions Big Blue Backyard will be unable to accommodate Confirmed Guests on days of EXTREME CODE. We will also be required to evacuate all guests on EXTREME CODE DAYS. Due to the Area restriction we will be unable to find alternative accommodation in this Region. Every endevour will be made to contact Guests prior to their arrival. All payments for nights not redeemed will be refunded. Cancellations 7 - 14 days prior to arrival and no alternative booking is made 100% of the deposit will be forfeited. Cancellations 7 days or less prior to arrival OR you do not arrive (No Show) full payment for the duration of the booking will charged to the nominated credit card. 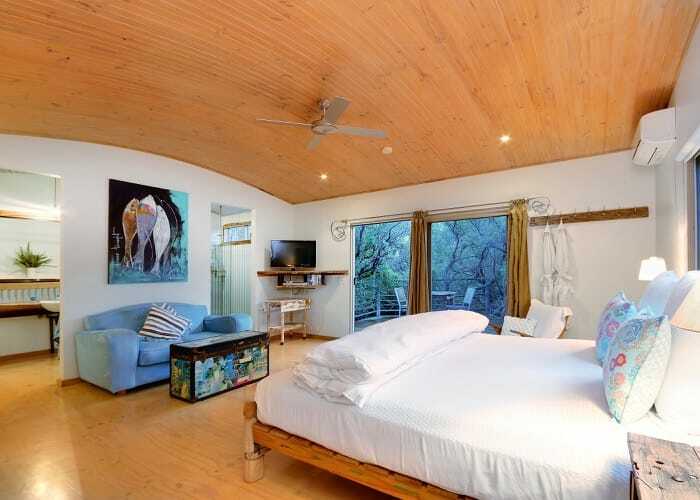 The Bush Hideaway is suitable for up to 2 guests. It features a king size bed, bathroom and outdoor spa bath. This rate includes breakfast provisions. This package includes 2 nights secluded accommodation in the hideaway of your choice, delicious breakfast provisions tucked into your hideaway for you to enjoy at whatever time you like in the morning, 2 Priority Passes to the fabulous Peninsula Hot Springs - no need to make a booking. Peninsula Hot Springs is an international award-winning natural mineral thermal springs and day spa centre, 2 one hour massages in the privacy of your own hideaway delivered by our excellent therapists, a Divine Deluxe Deli Tasting Platter to enjoy on the first night of your stay, no need to rush out to find food. Feast in seclusion, cocooned in the sound of the ocean, surrounded by ti tree & coastal bush. A complimentary bottle of local bubbles, chilled for your arrival and a decadent late Check Out of 12 noon. The Beach Hideaway is suitable for up to 2 guests. It features a king size bed, bathroom and outdoor spa bath. This rate includes breakfast provisions. The Dune Hideaway is suitable for up to 2 guests. 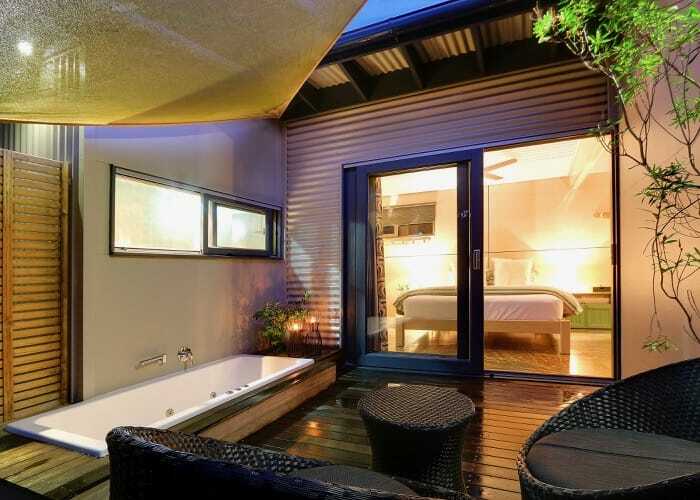 It features a king size bed, bathroom and outdoor spa bath. This rate includes breakfast provisions.